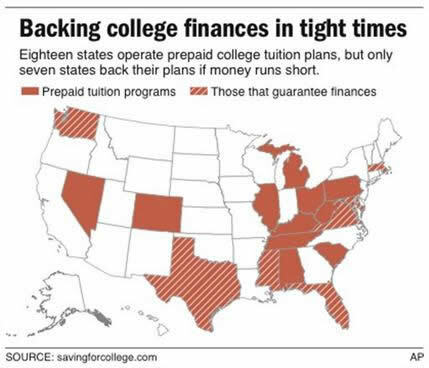 Currently, the plan hurting the most publicly is from Alabama, called the Prepaid Affordable College Tuition Plan (PACT). The plan’s asset value dropped from $899 million in September 2007 to $463 million at the end of January, nearly a 50% drop. Why? Because they invested over 70% of their assets in stocks, and also assumed a consistently high rate of return. The coverage from ABC News wildly misses the mark. Their headline “Market Endangers State-Run Tuition Plans” operates on the same theory as blaming Ford for drunk driving accidents. The Birmingham news does some actual journalism to get to the real heart of the problem. It seems that these plans fall prey to the same mistakes as many other publicly administered funds. Most egregiously, public fund managers are usually forced to fall back on unrealistic expectations to justify irresponsible investments that are “too aggressive,” i.e., too risky. Haines said Alabama’s as­sumed rate of return is unrea­listic, and requires too much risk. Fund managers also haven’t incorporated enough hedging investments to lessen the impact of a downturn in the market, he said. “We just felt that (the fund) was too aggressive,” he said. According to an actuarial report on the fund filed by the state in January 2008, the fund’s managers then as­sumed a rate of return of about 8 percent until 2013, and 8.5 percent after that. That report also found that the fund’s liabilities exceeded its assets by about $20 mil­lion. Bottom line: don’t invest in your state’s 529 plan without reading the fine print VERY closely. This entry was posted in Education, Public Finance and tagged Maryland, percent, Texas, Tony Woodlief on January 11, 2010 by Aaron Merrill.